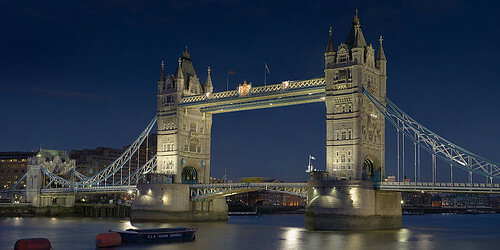 Tower Bridge: I think this may be my favourite of the sites we’ve looked at, though I can't put my finger on why. I suppose it's because I'm a sucker for bridges anyway, and this one is such a fairy tale of a thing. And it's so... London. Not that St. Paul's and Big Ben aren't London as well... I guess it's just that for me, Tower Bridge is special. And it turns out that the famous story about the American businessman who bought the old London Bridge and had it shipped to Arizona and reassembled, thinking he was getting Tower Bridge is actually just an urban legend... sad. During the few months when I was living in the north of the city, I devised a 10km running route home that took me across Tower Bridge and every time I ran across that bridge and past the Tower of London, even on evenings when I was frustrated by work, or tired, or just distracted, I consciously forced myself to pause (mentally, if not physically) and just think about where I was and what I was looking at. It just gives me a buzz. The Shard: Naturally, these kind of skyscraper projects are partly about being the tallest, and though the Shard will be the tallest building in Western Europe, it will still be downright titchy compared with the really really tall buildings out there (like the Petronas Towers). It will certainly be the tallest in Britain, and, as I said, the tallest in Western Europe (for the time being), but at a completed height of 310 metres, it will be merely 45th tallest building in the world. Still, it’s been interesting to watch it go up. It’s visible from all over, and I see it every morning from the bus as it chugs down the Old Kent Road to deliver me to work. 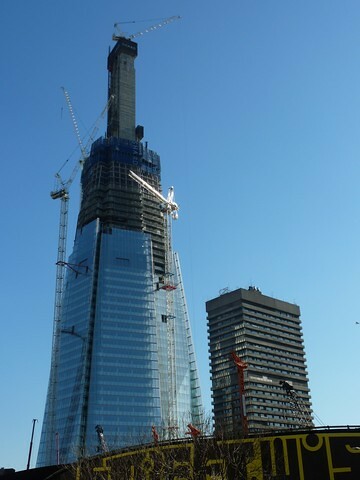 The Shard already thrusts so far above the skyline around it that it’s hard not to notice. It may not really rank among the tallest in the world, but for London – a city not known for its skyline - it’s still huge. In fact, you could put the Gherkin on top of St. Paul’s Cathedral, the Shard would still be 21 metres taller. And it looks like it will be quite a pretty thing when it’s completed in 2012 – all glass and shiny and interestingly triangular. It will house office space, high-end residential apartments, a spa, a five-star hotel, and public viewing galleries and an open-air observation deck on the 68th – 72nd floors. I’m sure that observation deck will be popular, especially since, unlike most other tall London Landmarks like the Monument and St. Paul’s, they will have high speed lifts (elevators) to carry people up to the top. Sadly, St. Paul’s lacks this crucial feature. Christopher Wren, what were you thinking? The London Eye: The Eye is currently properly known as the EDF Energy London Eye but was previously known as the Merlin Entertainments London Eye and the British Airways London Eye. (Rumour has it that when the current sponsorship deal expires in 2014 it will be known as the Your Name Here for 50 Quid A Day London Eye.) 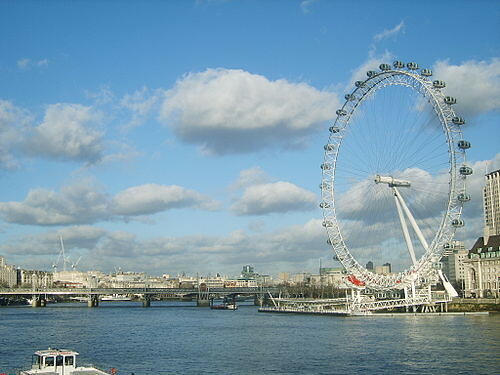 It’s a gigantic ferris wheel that sits on the south bank of the Thames, roughly across from the Houses of Parliament. Visitors travel in one of 32 sealed observation pods that are big enough to hold 25 people each, and a ticket on the Eye gets you one complete revolution – about a 30 minute ride. It’s the tallest ferris wheel in Europe, at 135m high, and is – I was shocked to discover - the most popular paid tourist attraction in the UK. I say shocked because it’s never been high on my list – it just doesn’t seem that special to me. There are big ferris wheels in other major cities, so this one seems kind of… unremarkable. Or perhaps I’m just put off by the prices for the whole thing which range from a merely usurious £16.74 for a standard adult ticket, through £19.98 for a Flexi Standard Ticket (whatever that is) up to a wallet-lightening £31.08 for a Flexi Fast Track ticket, which presumably lets you jump the queue and therefore seems downright un-English to me. Then again, maybe it’s the annoying website that puts me off. A ride on the Eye is referred to there as a “flight” (gag) and at least one spot on the website calls the Eye “London’s most iconic landmark” which is just jaw-droppingly ridiculous. When you share a skyline with Big Ben, St. Paul’s Cathedral and Tower Bridge it’s beyond arrogant to claim that title. However, a quick glance at Tripadvisor reveals that people love the thing, rave about the views and call it a must-do, so maybe I’m completely out to lunch. I guess I’ll have to save my pennies and go see for myself. Until then, I’ll just continue in my curmudgeonliness. The station’s size is hard to gauge from the photo, so here are a few numbers: the overall footprint of the building is an impressive 160 metres (520 ft) by 170 metres (560 ft) and the chimneys are 103 metres tall (338 feet). That makes those chimneys a third the height of the completed Shard, and in the same ballpark as the Whiz-Gro Fertilizer Partitally Limited Company (Trademark) London Eye. As late as the 1920s, power generation in London was a haphazard affair, with small local companies supplying a confusing and incompatible array of systems. In 1925 parliament decided that the power system needed to be unified as a single system under public ownership. The London Power Company was formed from several small companies and proposed to build a small number of large generating stations. Battersea Station A was the first of these, and was commissioned in 1933. Battersea B followed 20 years later, adding two more chimneys and creating the famous “upside-down snooker table” silhouette with which Londoners are so familiar. 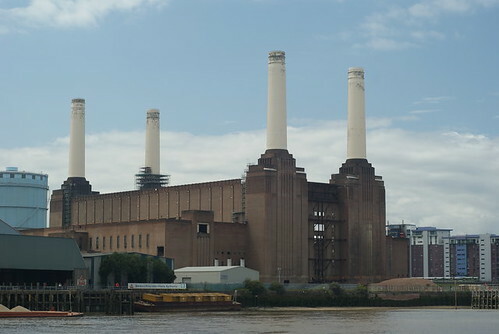 At its most productive, the Battersea stations produced about 509 megawatts, enough to supply about a fifth of London’s needs. As the plant aged, operating costs increased and its capacity fell until it was finally decommissioned completely in 1983. Since that time several redevelopment proposals have been put forward, perhaps the most interesting of which was a plan to build a theme park inside the station. To this end the roof was removed to allow the large machinery to be taken out. The plan was then promptly abandoned, leaving the inner steel structure of the station exposed to the elements. The current owner of the property is an Irish company, who have plans that actually include reusing part of the station to generate power from biomass and waste, along with an eco-dome and a park. The company also proposes to fund an extension of the Underground to reach to Battersea, which would be the first privately-funded extension of the system. Residents are generally in favour of the plan, but let’s not forget here that the company is Irish, and – no offense Ireland – but Irish real estate developers have not exactly been wildly successful in the recent past. I don’t honestly think anyone in London is holding their breathe for the redevelopment of Battersea Power Station in their lifetime. And there you have it – an overview of the interesting bits and bobs that stick out along the otherwise unremarkable London skyline. Now when you come visit you point to these places and impress other tourists with odd bits useless trivia. And if you happen to buy me a beer while you’re here… well, I wouldn’t say no. 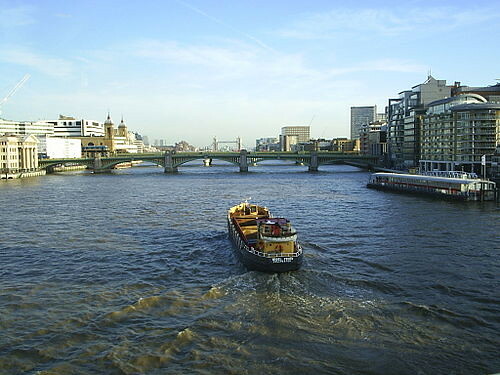 The River Thames: I hope that you all, being smart enough to read this blog in the first place, know that the correct pronunciation of the name of the river is "temz". Please, God, not with a soft "th" sound and/or rhyming with "games". Please. I'm begging you. The importance of the Thames to London is monumental, since it’s probably the reason the city is here in the first place. Human habitation along the Thames dates back to somewhere around 3000 BC, evidenced by the discovery of a Neolithic bowel found in the river, and the Romans settled in the area near the current site of London Bridge, which they called Londinium, which is an amazing coincidence, don’t you think? The Thames is tidal where it passes through London, rising and falling about 23 feet, which makes for some distinctly mucky views during low tide. It cuts through the city roughly west to east, with a great amount of meandering along the way. Most of the city lies to the north, with criminals, prostitutes and actors in the south. Oh wait - that's about a 500 year old distinction. Now it's perfectly lovely and respectable south of the river. I live there myself. However, there is still a lingering sense that anywhere south of the Thames is not quite so properly London as anywhere north. 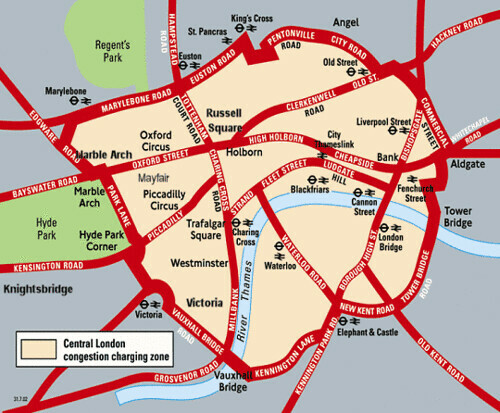 There are also fewer convenient transport links, but the real estate is cheaper. 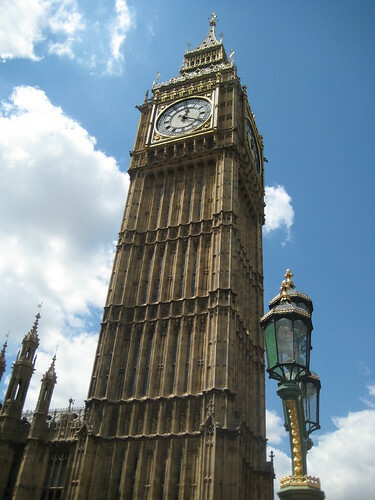 Big Ben: Located on the north side of the Thames at the foot of Westminster Bridge, the structure most people refer to as Big Ben is more properly know as the Clock Tower of the Palace of Westminster. (Big Ben is the name of the Great Bell – the one that tolls the hour.) It's the largest four-sided clock tower in the world, and the minute hand is about 14' long. I have never passed Big Ben, no matter what the time of day or night, without seeing tourists taking photos. The tower itself was designed by Augustus Pugin, a different architect than the one who designed the surrounding palace. Fantastically, Wikipedia claims that “The design for the Clock Tower was Pugin's last design before his final descent into madness and death…” Nothing like a little madness and death the spice up a blog post. Even more fantastically, the clock movement (completed in 1858 and invented for this clock by amateur horologist Edmund Beckett Denison) is apparently regulated by a “double three-legged gravity escapement” which is simply too delicious for even me to make up. (Ian, care to chime in here?) (Ha. See what I did there? Chime in…). The clock is famously accurate, and even managed to continue to toll the hour throughout heavy bombing during the Blitz. The BT (British Telecom) Tower: A 189m tall, skinny and somewhat inelegant structure opened in 1966 (and it looks like it) located just south and east of Regent's Park. Its first purpose was to house microwave aerials to support telecom traffic, and it was originally built by the General Post Office. 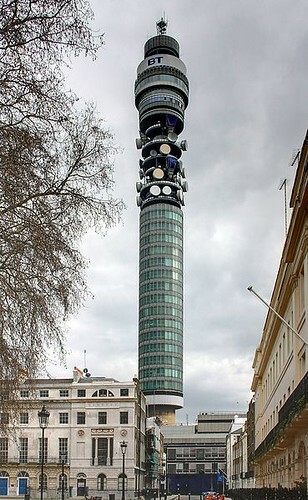 (Many Londoners still call it the Post Office Tower.) It's now owned and occupied by BT, and is not open to the public. I think the whole thing is a bit… "Jetsons". It’s as if the architect suddenly thought "Hey, we've been talking about the future for so long we must be in it! I'm going to design this building to look like THE FUTURE!" (I like to call this the "Winnipeg Clinic Building Effect"). Honestly, it looks like it should be tipped over and spinning slowly in the background of an episode of "Star Trek". "Until the mid-1990s, the building was officially a secret, and did not appear on official maps. Its existence was finally "confirmed" by Kate Hoey, MP, on 19 February 1993: "Hon. Members have given examples of seemingly trivial information that remains officially secret. An example that has not been mentioned, but which is so trivial that it is worth mentioning, is the absence of the British Telecom tower from Ordnance Survey maps. I hope that I am covered by parliamentary privilege when I reveal that the British Telecom tower does exist and that its address is 60 Cleveland Street, London." And yes, it had the mandatory rotating restaurant, though it's no longer open to the public and is only used for BT functions. In fact, London does not have a rotating restaurant at all, which makes you wonder how it can possibly claim to be a world class city. I mean really. St. Paul's Cathedral: You've GOT to know this one, right? It's right up there with Big Ben among London Landmarks. The current St. Paul's was, of course, designed by Sir Christopher Wren, and was consecrated in 1708, though the site has been home to a St. Paul's of some form or other since 604 A.D.. (Yes that's 604, not 1604. I'm telling you, this city is OLD.) It was apparently the tallest building in London until 1962 and has been host to many important events in the history of the city and nation, including the funerals of Nelson, Wellington, and Churchill, jubilee celebrations for Queen Victoria and Queen Elizabeth, and the wedding of Charles and Diana. 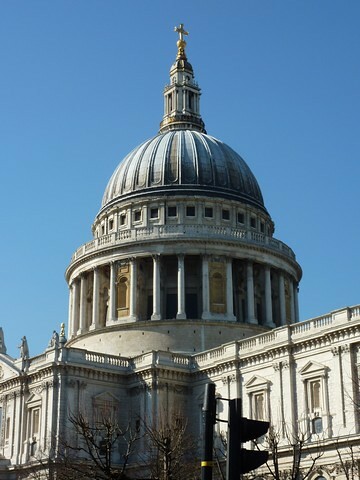 Such is the perceived importance of St. Paul's to the British psyche, that during a bad period of the Blitz in WWII, Churchill is said to have decreed that "St. Paul's must be saved" to preserve the morale of Londoners. This meant that teams of volunteers patrolled the rooms, crypts and corridors of the cathedral with water pumps and sandbags to douse any fires that were started. In one particularly tense moment during a bombing raid on the night of Dec. 29, 1940, an incendiary device landed on the famous domed roof and started to melt through the lead covering, but luckily it dislodged itself and was smothered by workers on the ground. So St. Paul's is still standing today, having received surprisingly little damage compared to the rest of the city. The Gherkin is a recent addition to the London skyline, officially opened in 2004, and reaching 180 metres in height. The site is the former home of the Baltic Exchange Building, which was badly damaged in a bombing by the Provisional IRA in 1992. Despite the desire to restore or rebuild the original building, damage to the structure was too great, and the façade and other important architectural details were salvaged and put into storage, paving the way for a completely new building. 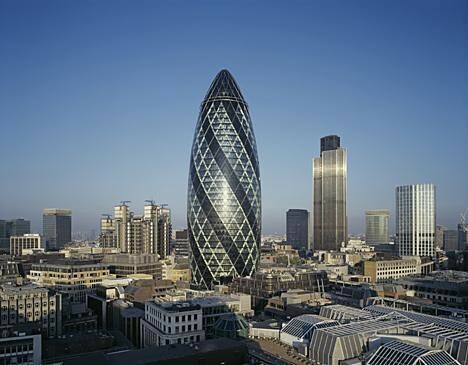 The unique shape of the Gherkin is an interesting departure for the city, and the design won many architectural awards for its design and sustainable energy features, including being named “the most admired new building in the world” according to a survey of architects in 2005. "During the early phases of construction, the grave of a teenage Roman girl was unearthed. After being sheltered in the Museum of London during the construction period, the grave was reinserted at the base of the skyscraper." And that’s it for north-of-the-Thames landmarks. Stay tuned for Part Two of the series, about the London landmarks south of the Thames, coming soon to a blog near you. Faffing about = wasting time, messing around endlessly with minor, often pointless tasks. It's a great phrase, perhaps used like this: "For God's sake would you please stop faffing about and get your coat on? I'm bleeding from four different orifices and I need you to drive me to the A&E!" A&E, short for: Accident and Emergency = The Emergency Room. Paracetamol = acetaminophen-based pain reliever. Used generically, like we use Tylenol. As in "I went to the A&E bleeding from four different orifices and all they gave me was a bloody paracetamol and a tetanus jab"
Jab = shot. Not as in "from a cannon", but as in "Have you had a flu jab?". This is one of those words that jars every time I hear it. It sounds bizarre and colloquial to me. Then I took a mental step back and thought about the word I’d normally use and realized it's actually got kind of scary connotations. 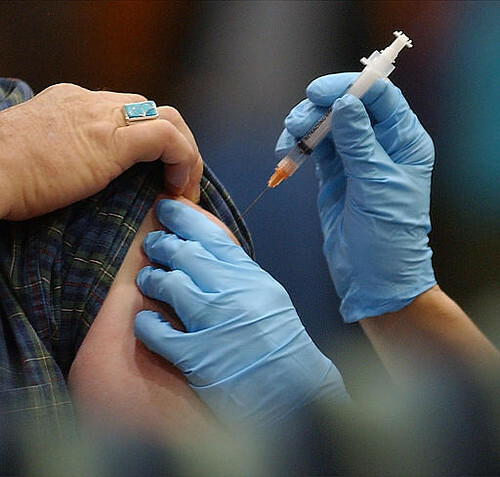 I mean if you had no preconceived notions, would you rather have a shot or a jab? Sign me up for a jab please; it sounds almost playful. See? That looks like a JAB, not a SHOT. Surgery = Doctor’s Office. It also means surgery as in “slicing open open of one’s body for medical purposes”, but if you’re making an appointment to see a GP, the appointment will be at the doctor’s surgery, even though they won’t actually perform surgery there. I find this really misleading and kind of alarming. It’s like calling barber shop a leechery. Maybe a few hundred years ago doctors did surgery at their surgery, but now they do it in an operating theatre. Operating Theatre = Operating Room. This is a favourite of cryptic crossword setters. They like to confuse with the phrase “theatre worker” meaning doctor or surgeon and not actor or stagehand. I find this particularly annoying. In fact, you could almost say it does my head in. Roundabout = Traffic Circle. A means of keeping traffic flowing by having all cars enter a circular road and choose which exit they want, thus eliminating traffic lights and long waits at intersections (snort!). However, for those few readers who have fond memories of the 8th Street Traffic Circle in Saskatoon, most roundabouts are not much like that. For one thing, they go clockwise. For another, they are sometimes so big that you’re not really aware that you’re on one because there are shopping centres or odd public artworks or other large things in the middle, like Dame Edna, or Wales. Conversely, they can be so small they’re nothing more than a slightly raised hump in the middle of an intersection, with curved arrows painted on the pavement around it (These are largely ignored. The humps that is, not the arrows. People are pretty solidly clear on the clockwise thing…). Roundabouts also often have many different exits shooting off at odd angles, because streets in London almost NEVER meet at a right angle, especially when they are close to the Congestion Charging Zone. 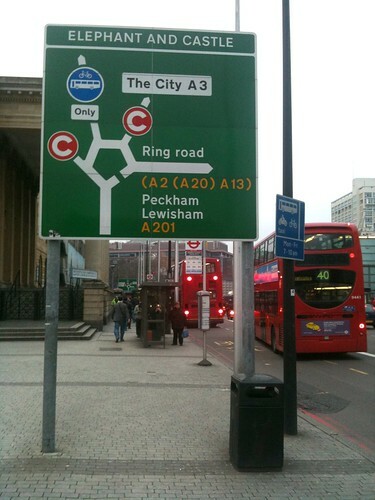 A traffic sign leading into the roundabout at Elephant & Castle (which is not even remotely as exotic as it sounds… unless you find getting lost in a maze of underground walkways and cheap market stalls selling “used” electronics and pirated DVDs exotic). 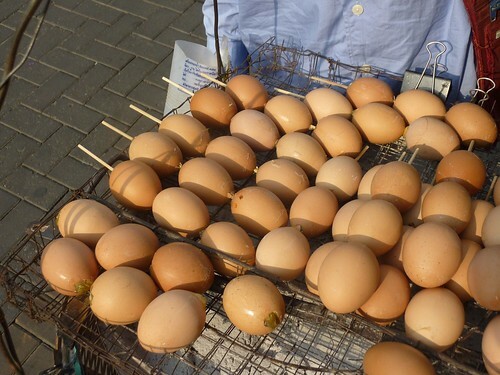 A favourite weird food – Eggs on a Stick! (Chaing Mai, Thailand). They were eggs… on a STICK! I love that! And now I live in London, UK, which has its own culinary reputation (Spam, Spam, eggs, chips and Spam, anyone?). I had a lot of fun, and only brief episodes of indigestion, with Steve’s Weird Food, so I thought there might be some mileage in a London version – not necessary weird foods, but different, indigenous foods that others might find interesting. So today Go Stay Work Play Live launches what is intended to be a recurring feature, tentatively called “GRUB!”. 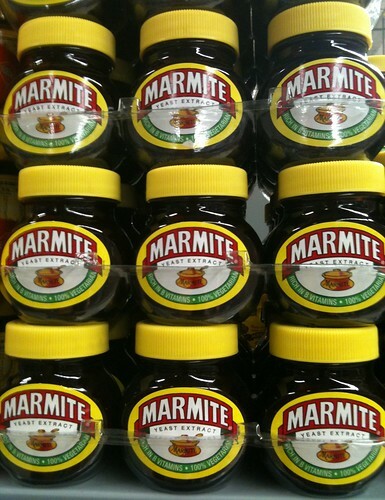 And how could I start with anything other than… Marmite! Marmite was first produced in 1902, from the discarded yeast leftover from brewing Bass Ale (excellent beer tie-in!). It was originally intended as a vegetarian substitute for beef-extract products like Bovril, which is a sort of beef stock / Oxo kind of thing, but became more popular in 1912 after the discovery of vitamins. It turns out Marmite is packed with B vitamins and folic acid (not naturally occurring, but added in the manufacturing process). And though it’s loaded in salt, the recommended serving size is small enough that it’s probably not a big deal for most people. It’s also fat free! I even found an unattributed mention (on a New Zealand website) claiming that during World War 1 the British Army commandeered the entire Marmite supply for the war effort and air-dropped to British troops to stave off vitamin B deficiency. Ah, Marmite, is there nothing you can’t do? Finally, as an added bonus, I’ll take a moment to mention a Marmite-like spin-off product that’s also got a place in my cupboard – Twiglets! 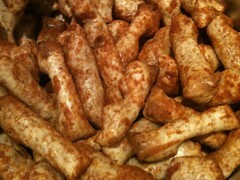 Twiglets are a sort of pretzel-like snack food flavoured with yeast extract. (Honestly, can someone not come up with a better name for that stuff? Yeast extract? Ugh. If it were American it would be called something like Yummo Sauce or Freedom Flavouring.) Twiglets are, not surprisngly, sort of twig shaped, and made out of whole grain flour (or wholemeal, as they say in these parts), and baked, not fried. So as snack foods go they’re pretty healthy, and have the advantage that if you accidentally leave them out for general consumption, there’s a good chance no one else will touch them. They are also good after a run, because of the saltiness. And naturally they are excellent with beer. And there you have it. Marmite, Twiglets, and a dig at Justin Bieber. What else could you ask for? 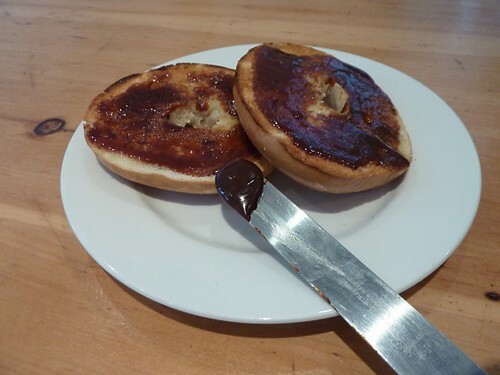 * These odes to Marmite are NOT of my creation – they must be some kind of ad campaign the company ran, because they appeared on several recent jars of Marmite that have passed through my cupboard, attributed to different Marmite lovers across the land.